Video tags also provides information about a video like the Title, Publisher, Copyright information and other information available. 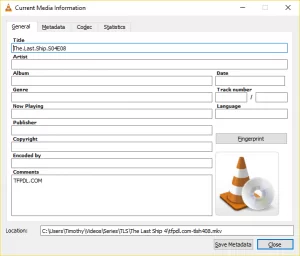 VLC Media player can be used to edit this tags in both video and audio files. 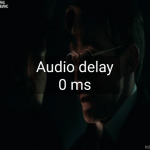 1) Open audio or video you want to edit the tag on VLC. 2 ) After opening the audio or video file, on the menu bar of VLC, Click on Tools and then select Media Information OR Press Ctrl + I on your keyboard. 3) A window “Current Media Information” will be opened . 4) On the General tab of the window, You can edit the Title, Artist, Album, Genre, Now Playing, Publisher, Copyright, Encoded By, Comments, Date, Track Number, Language and others. 5) After editing the information you want to edit, Click on Save Metadata below (Where the orange box is). 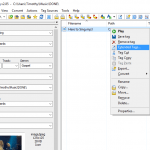 Hope with this, you have learnt How to Edit Audio or Video Tags with VLC Media Player. VLC Media Player, I select My Music on the left-hand side to see all the music file on my PC. I then go through them one by one, updating the media information function in tools. I do a Ctrl I and select the “fingerprint” button to get the correct format of name and artist. I then select the matching identity and press the “Apply this identity to file”. Press “Save Metafile” and then press “Close”. I close the VLC program, reopen and my changes are reverted back to what it previously was. I have been plugging changes all day and now I am confused if I should have been saving this somewhere. If you save the video to a playlist file (*.xspf), the tags will be saved (when you play that playlist again). It works only for that one opening of the video file. Once you close it, and open again, the tags will be back to what they were before.